Reading for Research: Monthly Challenge--It All Adds Up! Can you solve this problem? I'm counting on you. Don't make a miscallulated move. Just try the monthly challenge. Do a number on it--that is write about numbers and math. Tally these books on the subject. A story written in rhyme with wonderful back matter is The Girl With a Mind for Math: The Story of Raye Montague. The author is Julia Finley Mosca. The book is illustrated by Daniel Rieley. as they followed the guide. giving Raye's head a pat. "But my dear, YOU don't need to know all about that." 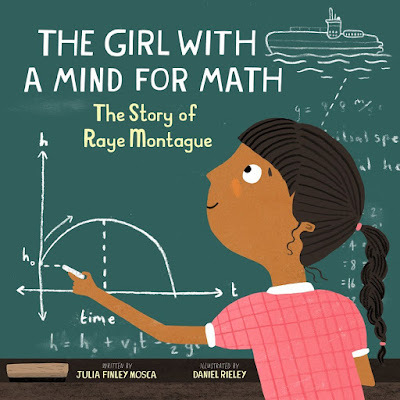 The heroine of this story was a mathematical genius. 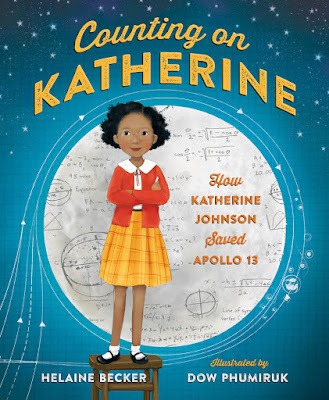 Counting on Katherine: How Katherine Johnson Saved Apollo 13 is written by Helaine Becker and illustrated by Dow Phumiruk. The end pages are covered in calculations. "Katherine yearned to know as much as she could about numbers, about the universe--about everything!" " Katherine's boundless curiosity turned her into a star student. She was so bright, she skipped three whole grades. She catapulted right past her brother! (He wasn't too happy about that.)" Another true story of a mathematician is the story of Sophie Germain. 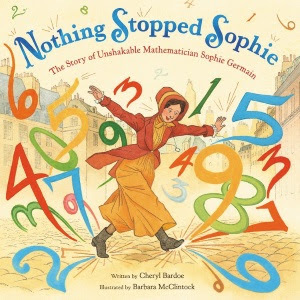 Nothing Stopped Sophie:The Story of Unshakable Mathematician Sophie Germain by Cheryl Bardoe and illustrated by Barbara McClintock. Not only do the end pages have calculations on them, but numbers are featured in the art work throughout the book. "Long ago in Paris, a young girl named Sophie Germain understood that math could do more than measure the lengths of silk and tally accounts in her father's shop. In those days, people scoffed at girls for thinking about anything more serious than hair ribbons or what music to play on the pianoforte. But nothing stopped Sophie." Your days are numbered? I'm counting on you! Write a story about numbers and math. It all adds up! Oh, Janie, so many great puns here! I love all the stories you featured. Love when that happens! Happy writing. A great list of number-oriented books to read. Adding them to my list for the library. Love these books! Great for when kids ask "WHY do I have to learn math?" Thanks for sharing! LOVE this post, Janie! And I can't wait to read these math books! Timing is everything. Happy to help. Yes, share the math love, Jilanne! I can always count on you Charlotte. LOVE these, Janie. I need to create a list of women inventors for a guest blog post on Pragmatic Mom...I will definitely be adding these to my list! Who knew that math could be so much fun! What a terrific list you've shared. Thanks so much! Patricia, I am not a numbers person, but enjoyed them too! Great prompt. I started writing before I finished reading the post. An idea has been adding up bit by bit in my head. words started to flow. Thank you for the challenge. Thank you also for the list of biographies. Sarah you rock! Write on! I enjoyed learning about these picture books!